July « 2015 « Geekorner-Geekulture. I’ve been very busy this past week, with 12 hour workdays every single day. I watched 5 of the 10 shows I intended to, so here’s a first part first impressions. There’ll be part 2. I should have more time again from next week, so expect a return to normalcy in the third week. As I actually wrote something longer for each of these shows, I’ll keep it brief, and link to the lengthier impressions post. As always, the list is ordered by how much I liked the episodes, combined with how good I thought they were, in a descending order (first is best, last is worst). Durarara!! is back! True to the way the first season, and the second one started, we had a sort of quiet episode. 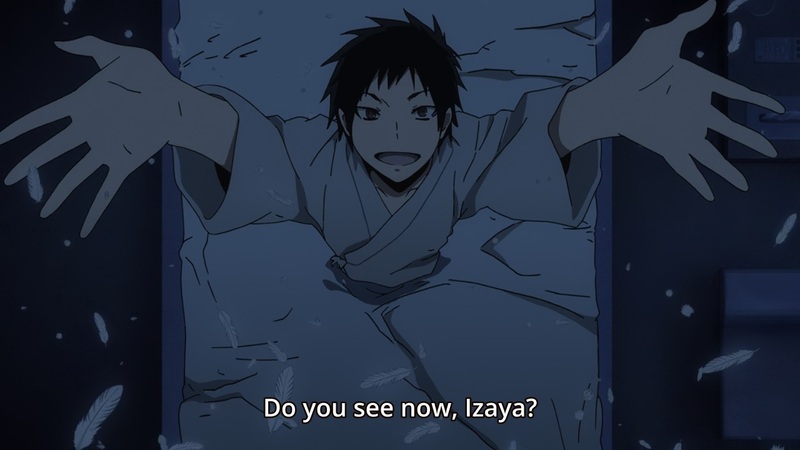 “Sort of” is exactly right, because as we saw characters going about their daily lives, it was still full of small paths that criss-cross, and we’ve had some time inside Izaya’s head, narrating his life, in a manner similar to both how we’ve had for Mikado when we first encountered him, and mirroring the girl in the 2nd episode whom Izaya tricked. Izaya is a jerk, he’s a scary villain because he understands people deeply, and uses this knowledge to crush their hopes and dreams. But he’s still great to watch in terms of screen presence. Things are going on in Durarara! !, and although in this episode we supposedly took a break from “the main plot”, there were plenty of signs in the background, true to show’s fashion.